Life can be kind of funny the way things can seem to line-up. One of our gaming group, a Junior in High School who is just getting into gaming, has developed a a thirst for sci fi and fantasy. 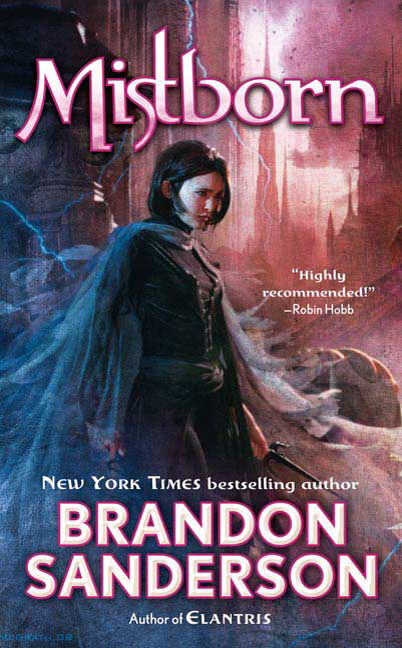 When she took to social media for book recommendations one of her friends immediately recommended The Mistborn series by Brandon Sanderson. This was such as strange exchange to have come up because just that prior week we had stumbled upon The Mistborn series twice in its own way. 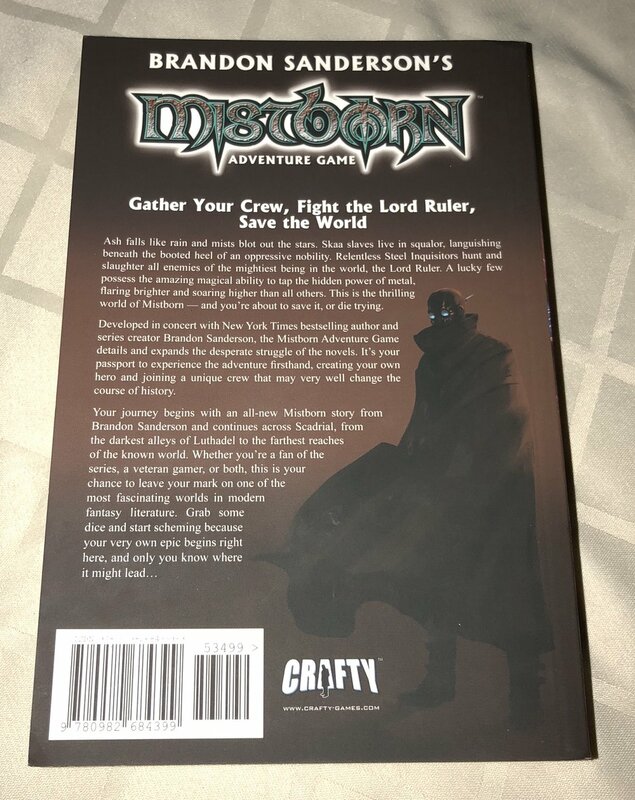 The first time we saw it was when our friends at The Gamerati sent us a copy of the Mistborn RPG. The new 2012 RPG book has certainly met and exceeded our expectation. When we opened the book we were greeted by a short story that quickly dropped us into the world and the general concept. If you've heard our podcast episodes on Spycraft you know how high praise I have for Crafty Games products and their design aspects. It's usually hard to do a black-and-white layout and do it well--usually it drums up visions of RPGs origins in the 80's and 90's. HOWEVER, this book has style! The layout, font, and even the art flow extremely well and it isn't crowded like older tomes when designers tried to cram information to save space. This is everything you need to get started flowing over 500+ pages (talk about bang for your buck). Then you have to consider what this book is tackling. I've always felt that magic and magecraft is perhaps one of the best nuances that elevates the RPG experience. It's the opportunity to find your own larger-than-life solutions for problems. The Mistborn universe has a unique magic that revolves around metals--trust me it's pretty awesome. Imagine using metal properties to fly, shoot projectile coins, or control your opponents! Those who have these powers are called Mistborn. The world is overseen by a somewhat authoritative ruler who is both the head of the political, religious, and magical pillars of society. Now add to that a somewhat chaotic and alien world where the reader/player finds themselves at a loss of the common rules of society. Walking into an unknown experience is a beautiful part of gaming I haven't had since I first got into the hobby as a child and have been chasing ever since. However, experiencing the world of Mistborn doesn't end there! 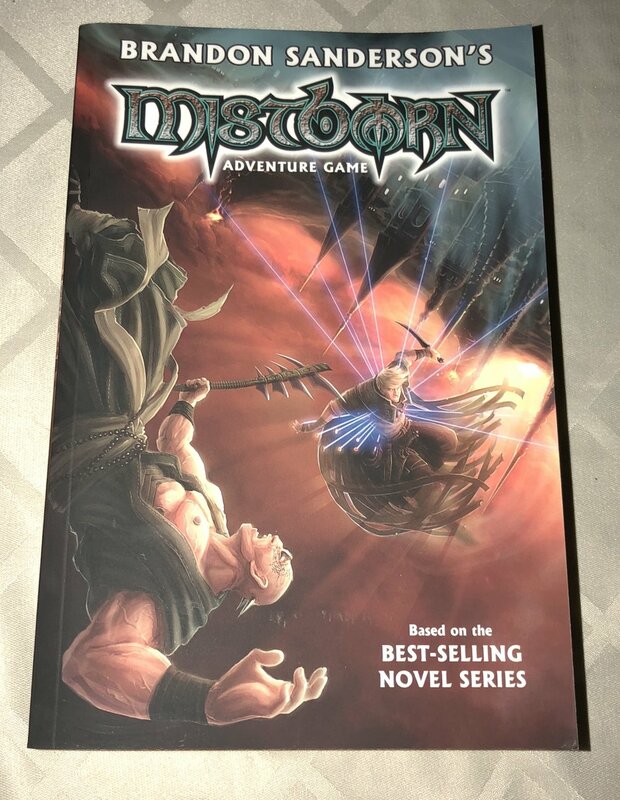 In June of 2016 Crafty Games launched a heck of a Kickstarter for a boardgame set in this universe called Mistborn: House War which reached x10 its goal at $339,000! While the books and RPG game focuses more on the lower, common man fighting for freedom; the boardgame focuses on the noble houses fighting for and maintaining control. There is an interesting nuance to the majority of fantasy world's in gaming that the novelizations of them come into existence as a extension of a previous game setting like Forgotten Realms or even Pathfinder, for instance. However, that the game is coming into existence as a response to a desire to participate in the story, an award winning story at that, places this game in a rare category akin to Game of Thrones. This truly is a gem you should seek out! Newer PostIntroducing "Seriously, Let's Play"